Try making these cute bird nests for any kiddie party and children will love it! They are completely vegetarian, easy to make and looks attractive too. Peel the potatoes, and cut them into thin wedges. Boil them with a little salt and then mash them. Keep aside. To the mashed potatoes, add grated onions, chopped chillies,salt, red chili powder, ginger powder, black pepper powder, white pepper powder, cumin powder, and coriander powder. In a small bowl, add corn flour, all purpose flour, salt and water to make to make a thick paste. This will be used as a coating for the nest. Break vermicelli into shorter strands and keep aside. Grease hands with a little oil. 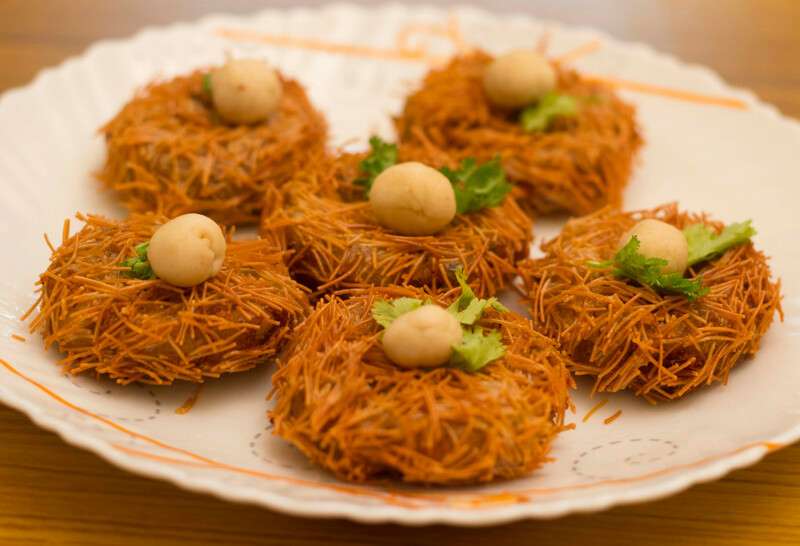 Take small balls of the potato mix and shape into little nests. For this, roll into a ball, then flatten it and finally make a small well in the center of each patty. Keep aside and repeat with the rest of the mix. Now gently dip each potato nest in the flour liquid mix and then coat with the broken vermicelli. Repeat the procedure until all the nests are coated in the same manner. Heat oil in a thick and large pan. Once hot, gently add in the prepared nests and fry until golden brown. Take out with a slotted spoon and place on a tissue paper. Next, we need to make the eggs for the nest. It is made out of paneer. Boil milk and then add lime juice. Once it curdles, strain into a muslin cloth. Then squeeze to drain the water. Wrap in the muslin cloth, and place a weight on top of it. Let it sit undisturbed for 15- 20 minutes until you get a firm mass of paneer or cottage cheese. Unwrap this paneer and crumble well. Ensure that it is smooth and free of lumps. Knead and then shape into small balls that resemble boiled bird's eggs. To garnish, place the fried nest on a plate, garnish with two small coriander leaves and then top with 2-3 paneer eggs.. Serve with mayonnaise or ketchup. This is a kid friendly recipe. But you can reduce the spice levels if you like. A non vegetarian version can be prepared with minced chicken also.